Journey through Open Spaces is officially open! While I had all pastels matted and framed by Sunday night, there were few small things that I needed to complete. 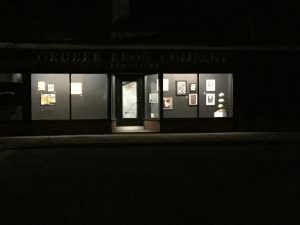 I updated my biography and artist statement, created gallery tags for each piece, and finalized a price list. 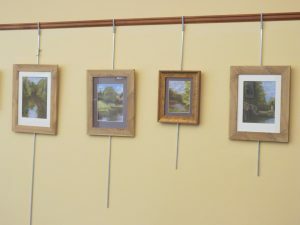 I arrived half an hour or so after the library opened to hang my pastels. I met with a library staff member who helped me get the hook over plain rods for each pastel. Many gallery spaces uses these rods so that no nail marks are made in the wall. I was informed the gallery tags I created could not be taped to the wall. I hadn’t received any specific documentation about exhibit guidelines so it was a good thing she mentioned it to me. Once I had the space planned out, I began hanging each piece. Luckily I had help from a family member, which made hanging the exhibit even easier. Overall, from the time I arrived to the time I left the library, it took only a little more than 2 hours. The experience of hanging an exhibit wouldn’t be complete without realizing I had forgotten something. I forgot the postcards I created and a guest book. Later in the afternoon, I came back with the postcards and guest book. When I dropped off the guest book, I added the exhibit title and dates to the book. What I didn’t realize was that I forgot to leave the pen I brought with me for everyone to use. Fortunately for me, a friend came to the exhibit and left a pen. The view of one wall of the exhibit. 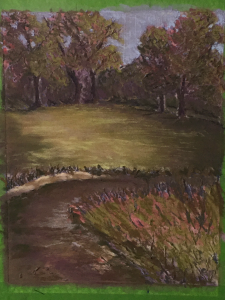 A view of some pastels in the exhibit. Let the week countdown to the 7-week exhibition begin. Last week I mentioned 23 pieces were matted and framed. Now there are 25 pieces framed and ready for the exhibit. I finalized the piece I was doing last week so it brings the total number of artworks to 26. When I mentioned to my classmates I have an upcoming exhibit,they asked me how many pieces I would display. I responded by saying 24 pieces. They were all surprised by the amount of work I have ready to display. Another friend was surprised at the amount of pastels. I don’t see it being a huge amount; I’ve been working on pastels since September 2015. 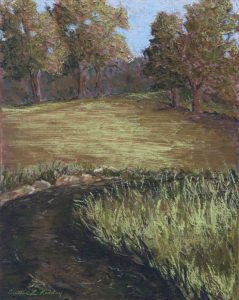 I’ve always been inspired by landscapes so whenever I’m in a class my main subject matter has been landscapes. 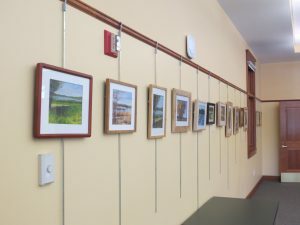 Last year when I knew I would have an exhibit in Stow, I made the conscious decision to have all those pastels connected by imagery of open spaces such as National Parks, National Refuges, and Botanical Gardens. 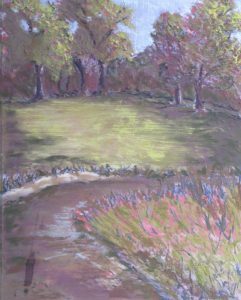 I continued that imagery as I took classes or worked on pastels on my own. As I was speaking with a friend today, I said I had two other pastels I could include but I hadn’t thought of framing the pieces. She thought I could and should include them. My brother thought the same thing. He said it’s better to have too many pieces when I go to hang the exhibit then to think to myself, “I wish I had framed those pieces as there’s still space to display work.” Also, it’s much easier to bring home a piece if there’s no room then to rush around matting and framing an artwork at the last minute. 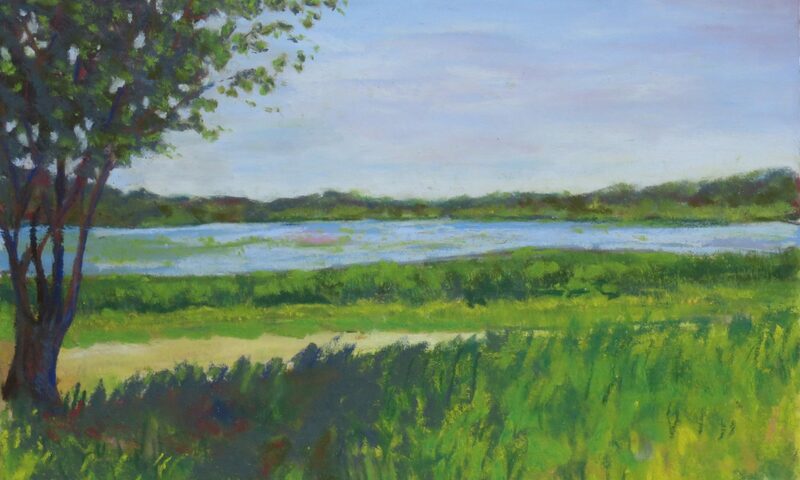 In two weeks, I’ll be hanging my pastels for a 7-week exhibition. I’m feeling pretty good about how parpared I am for this exhibit. Last week I mailed postcards to family, friends and a few artists I know. I placed a few postcards on a table at work and will keep a few for the library. During the past two weeks I’ve also worked on matting and framing a number of my pastels. At this moment I have 23 pastels matted and framed. There are 2 pastels I still need to frame and mat. 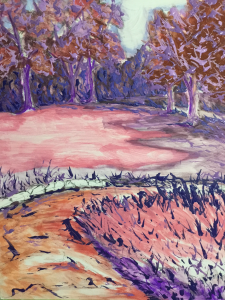 I may also include another pastel that I am working on currently. I haven’t finalized it but it’s very close to completion.